We're happy to say there was great improvement with Truffle's eye. The stain indicated a small section still on the eye, which is probably where the original scratch occurred. Dr. Strom was very impressed with the improvement in Truffle's eye. Mom Paula needs to continue putting the medication in her eye until the end of next week. Truffle will go back next Friday to make sure everything has healed as it should. Truffle is also due her annual checkup and if everything is okay next week, she'll have that done, too. As usual, Brulee accompanied Truffle to the vet. 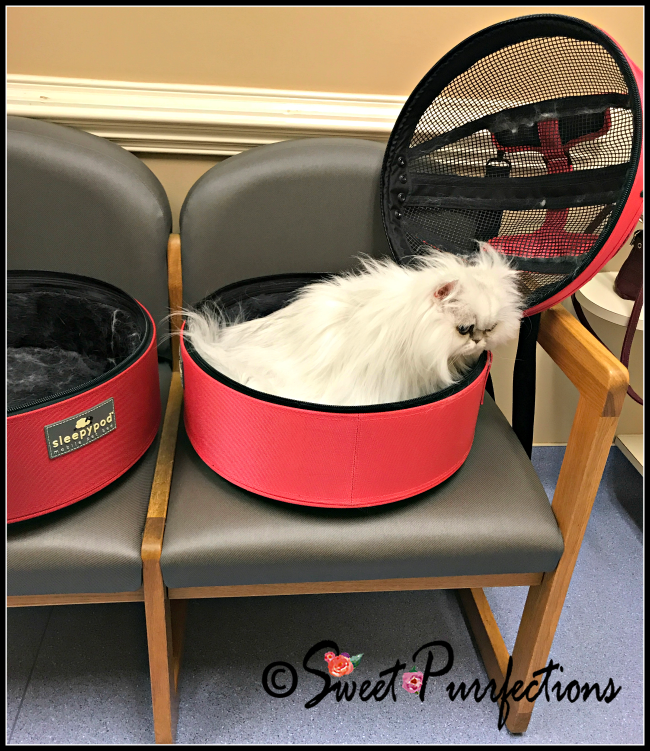 Brulee stayed in her Sleepypod or under the chairs while Truffle was being examined. 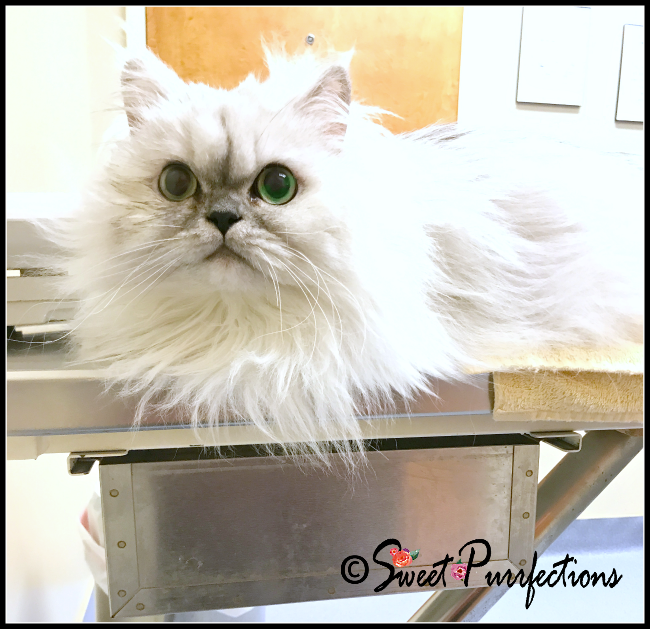 Dr. Strom did look at Brulee and said her eyes looked good - she just has the normal drainage because of her flat face. Mom Paula is going back to the doctor this afternoon. We hope this weekend brings healing for everyone in the family. Thank you for your purrs! Truffle, "no, Mom, I'm fine, seriously." Brulee, "I don't know why I need to go to the vet, I'm not sick." I'm glad Truffle's eye is doing better. We love your personalities girls ... you certainly know how to communicate your displeasure! Healing purrs to everyone - have a nice weekend! Lots of healing purrs coming your way. We hope everyone gets better soon! I have a few pictures to send for the calendar if you still have room. Will get them in tonight or tomorrow morning. We hope the healing works quickly!!! 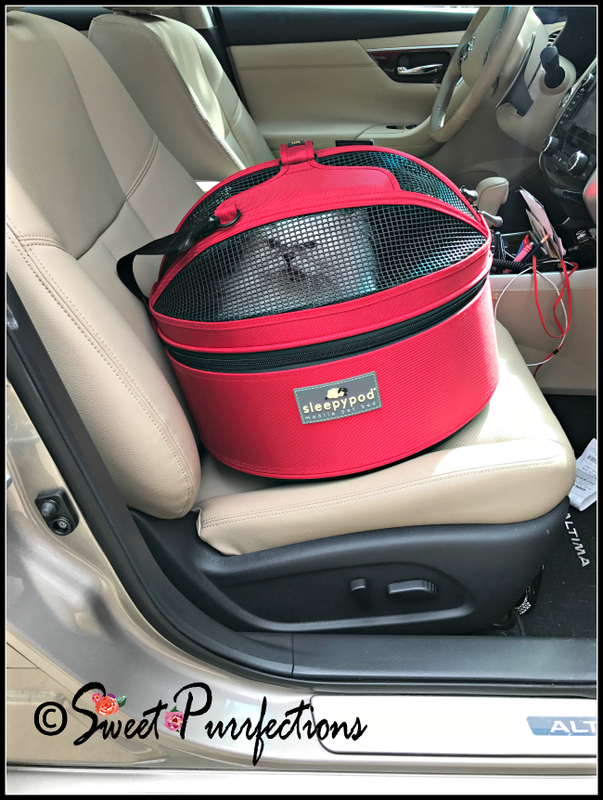 Purrayers for a good report for your Mom - glad the Purrfections got good reports! We're so glad to hear Truffle has improved so much. Glad your eye is better Truffle! One of our puppies had the same issue. Our Vet day in in February. But he thinks he is going to bring us to a Petco groomer for clippy-claws. We won't let him do it, but we are starting to stick to the blankies and his clothes. And skin. I'm so happy to hear Truffle is doing better! We are happy to hear Truffle's eye is healing! Glad to hear you are improving, Truffle!